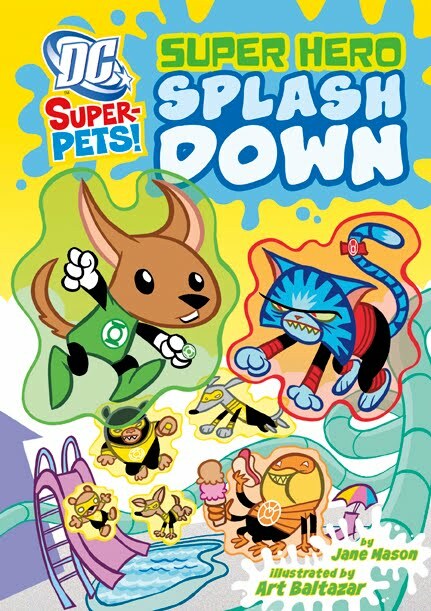 Trade Reading Order » Review: DC Super-Pets Books 1-6 Round-Up! Click the covers to view them larger or the titles to see publication information. These brightly colored little books all turned out to be of consistent quality and tone, so I decided to do a little round-up review for the whole set. According to the press information, the six books above are the first releases in a projected series of 24. 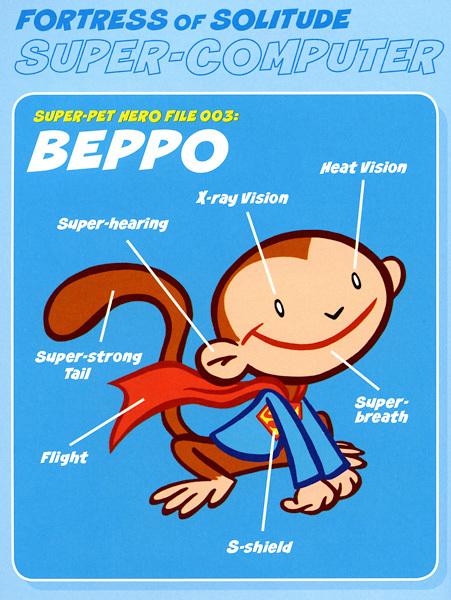 Each is illustrated by Art Baltazar, celebrated for his Eisner Award-winning work on DC’s All Ages Tiny Titans comic series. That description is fair, because while the more durable format is probably a wise investment for libraries and schools, most families may find it easier to fit the 4.95 list price softcovers into their budgets. The softcovers are still quite nice, with clear high quality paper, lovely color printing, and durable feeling bindings despite their small size. They will feel much at home in smaller hands, whose owners probably won’t be afraid to bend the book while hovering over their favorite pages. The books are designed from the ground up as a set. Each one follows a simple and informative format. 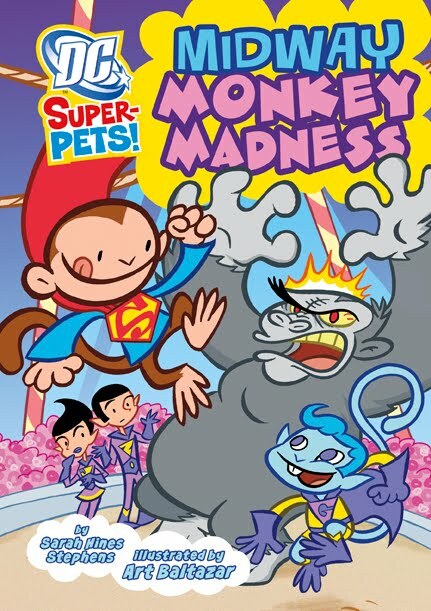 The bright, pastel cover opens to the DC Super-Pets! logo followed by a two page spread of the series cast (repeated in the back of the book.) Then comes a title and credit page, with floating heads of a couple of the featured pets. After that, we find out who is starring in the book, on a single page introducing the pet, their nemesis, and usually the superhero or villain counterparts. Across from this page there is a colorful table of contents. Then we get a computer file on our main super-pet, which is fun – under the heading “Paradise Isle Royal Computer” for example. This file shows abilities, points out costume pieces, includes a height line up, and bio plus information like Species, Place of Birth, Age, and Favorite Food. After that there’s about 42 pages of illustrated story. 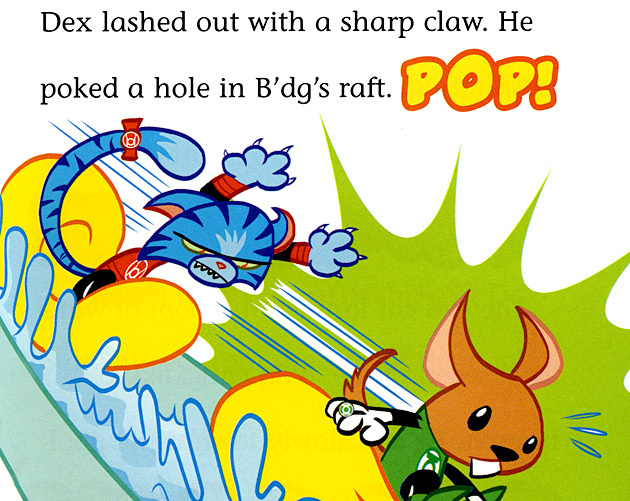 The stories are mostly large-type text punctuated by special font sound effects and the odd floating head showing relevant expression. Every couple pages has a half or fourth page illustration, with the odd full page or 2-page splash mixed in. 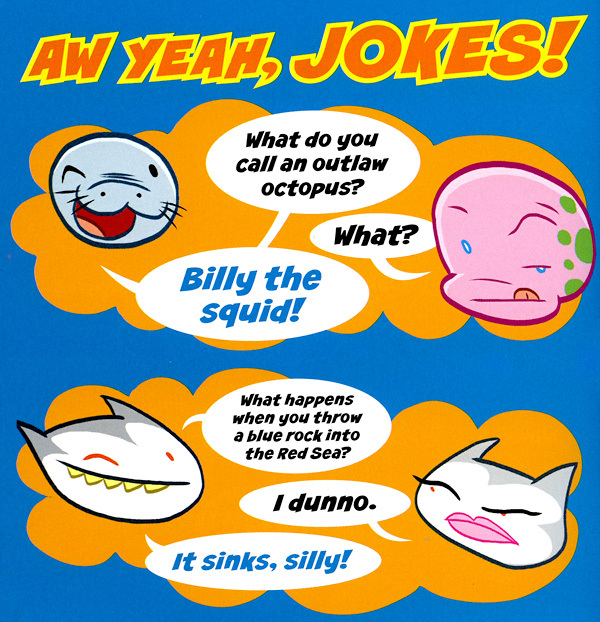 There’s also single pages in the back devoted to “Aw Yeah, Jokes!”, “Word Power!”, “Meet The Author/Illustrator!” and, of course, an advertisement/listing of the other books in the series, the publisher’s website, and publication information. Now that you’ve got some idea of the format, I should talk about the actual content. While each book features work by Art Baltazar (a great idea to keep a single illustrator to build recognition among the kids), the authors vary. J.E. Bright, Sarah Hines Stephens, John Sazaklis, and Jane Mason have all turned in work similar enough that it should be totally indistinguishable to young readers. That, in itself, isn’t a bad thing – you don’t have to worry about any of these books being terrible or suddenly offensive. But the series probably won’t gain any of them particular individual acclaim. Baltazar’s art is nicely printed and of his usual high quality. The bright and often pastel color scheme is warm and inviting and his expressions should be immediately understood by all readers. If I had any complaint at all, it’s only that I wish these were actual comics so we could see more drawings. Which isn’t really a complaint – I hope they inspire many readers to seek out his comic work. 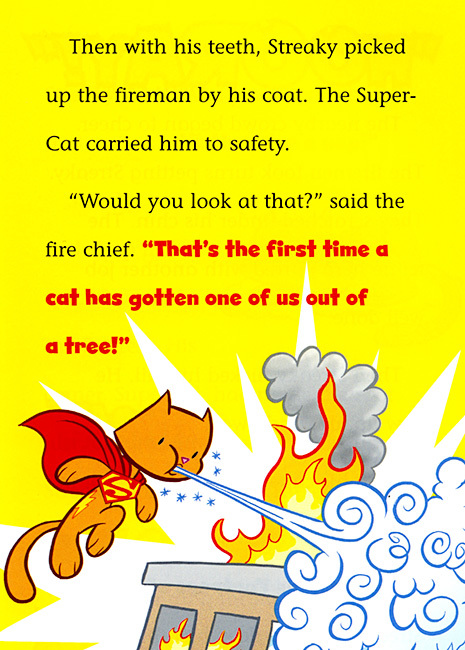 The stories feature the pets almost exclusively. While there is the odd appearance by owners, usually at the start and end of a story, these animals are their own heroes. They solve problems and build relationships all on their own. The solutions they find are generally competitive but non-violent. They’re sometimes surprisingly cooperative with their rivals. This is great, because most children will probably empathize with the animals in the pet/owner relationship and encouraging problem solving independent from the heroes/parents is a good theme. The actual plots are very silly. Much like the Silver Age comics in the 1960s that most of these characters sprung from, they place more emphasis on lighthearted action than logical cause and effect. 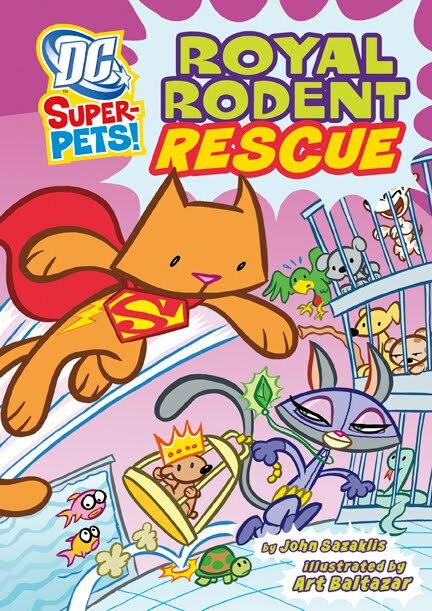 Sometimes events are fairly straightforward, like in Sazaklis‘ Royal Rodent Rescue, where Streaky the Supercat must save a mouse prince from Rozz the.. er, Catwoman Cat. Others have some out-of-nowhere solutions to plot elements that I found a little confusing. I felt kind of dumb to be flipping back a couple pages to try and figure out what happened in a young reader book, but I’ve decided the problem was not really mine. 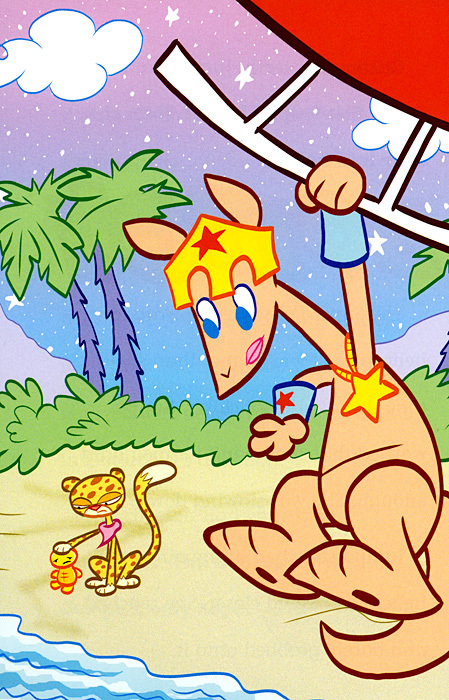 For example, a helicopter comes out of nowhere on Paradise Island to help Jumpa the Kanga in The Fastest Pet On Earth and disappears, never to be seen or mentioned again. Of course, young readers might not even notice this in their rush to find out what happens next. While I think that even children appreciate clarity, perhaps such things will end up as jumping off points for their own side stories. As a parent or mentor, you may find that stream of “why?” and “and then what?”-style questions to lead to hours of entertainment. Since I was, unfortunately, reading these books on my own, I’ve missed out on that side of the experience. And let me be clear, while those of us obsessed with the DC Universe may experience some interest in these books, they really are for beginning readers. They’re lovingly crafted for this purpose. 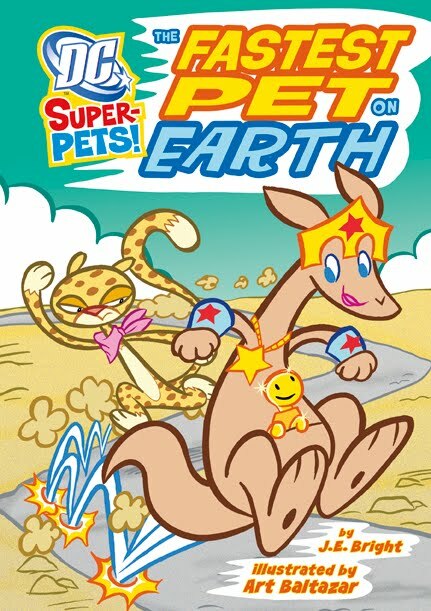 From the terrible pun-filled jokes in the back (my favorite kind) to the word lessons and bolding of action, the Super-Pets titles beg to be read alongside an excited kid. Recommended for grades 1-3, you may find yourself purchasing the books for children even younger with the intention of enjoying the action together. This would be the ideal situation. Want to hook people on the DC Universe young? Bring them along on a babysitting gig or make sure they’re available in your local library. That’s the flip side – these are gateway books. 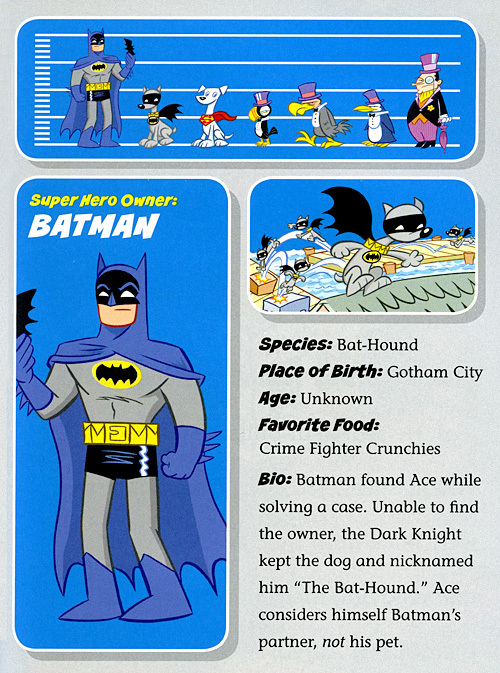 They contain appearances by DC characters big and small – from Batman to Gorilla Grodd or The Wonder Twins. Superhero comics, though long read by factory workers and soldiers, from the moment they first appeared, were also for children. Nowadays, the average book is more likely to carry a content warning than a lesson page in the back or tear-out ads for dollar lizards. It’s actually a small problem, too, with this large franchise characters. It’s all fine and good to get children into superheroes, but it may become slightly complex when those same heroes are dealing with very adult content in publications being released at exactly the same time. Will a child walk into a comic store, see Batman and immediately pick up what could be an insanely violent and dark comic? Of course, this issue isn’t anything new. I was a kid in the 90s, raised on Batman and Spider-Man cartoons contrasting with the often ultra-violent comics of the era. I don’t think it affected me too badly and in the end I suppose the solution is always the same one – reasoned and attentive parenting. If you’re worried about what your child is reading, the simple answer is to read with them. Or alongside them. At the very least, it will give you something to talk about! 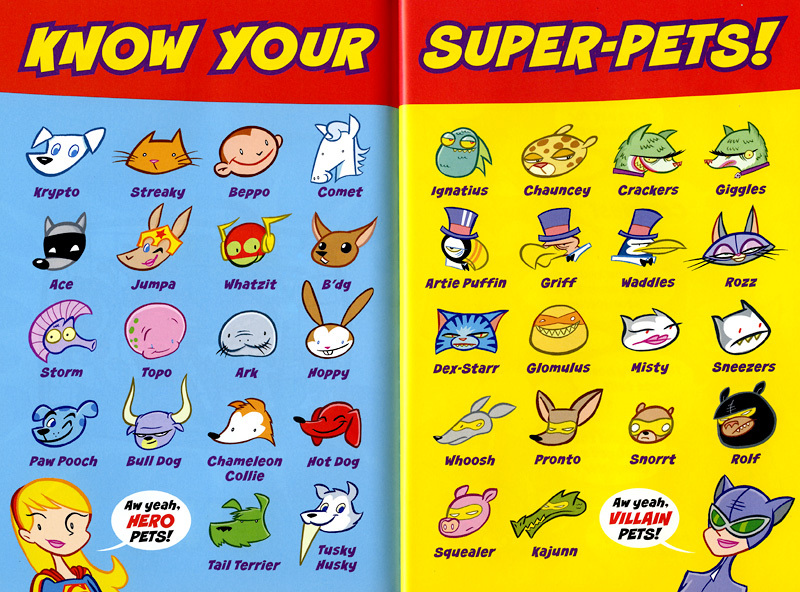 As for the Super-Pets series, I’m sure they will continue to be books ideal for shared reading and ideal for schoolroom bookshelves. 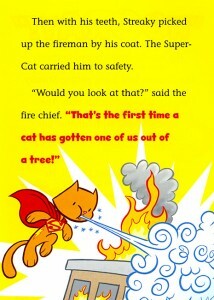 Familiar superhero-based animals are bound to interest many children wary of getting into other boring looking books. Hopefully this series will be a gateway to the DC Universe, comics, and most importantly – a lifelong pursuit of literacy. The greatest gift you can give a child is a love of words. Capstone is sponsoring a fantastic writing contest for kids in conjunction with the launch of the series. The “My Pet Is Super!” contest invites kids in grades 1-3 to write a newspaper article about their pet for The Daily Planet. 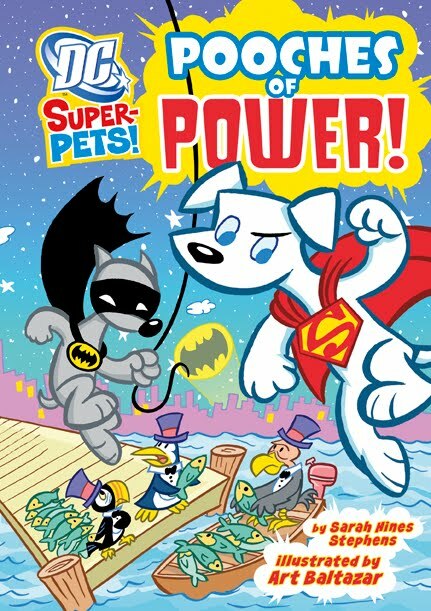 The winning “reporter” will have his/her super-pet drawn by award-winning comic illustrator Art Baltazar (illustrator of the SUPER-PETS series) and the super-pet will appear in a future book in the series. The winner and his/her school will also receive books. The top 50 entrants will receive two free books– one for the child and one for his/her school library. For complete rules and to enter, visit www.CapstoneKids.com. The contest runs from January 15, 2011-February 28, 2011. 4 out of 5 overall. Some of the books are more like a 3.5 and some are closer to 4.5, but every reader will have a different favorite. 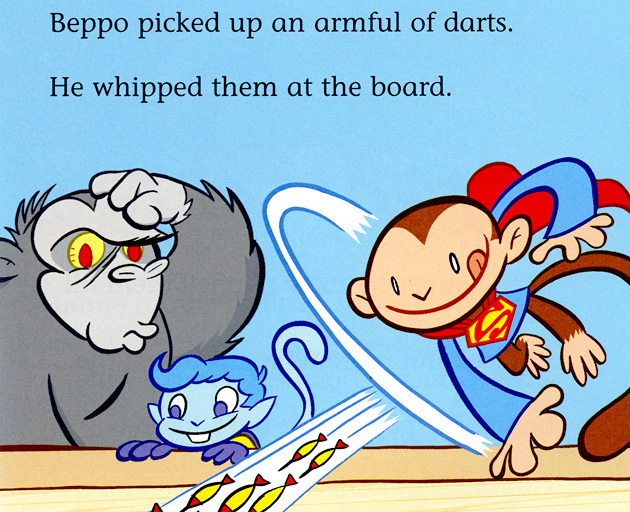 They’re relatively lightweight, even for children’s books, but beautifully illustrated and full of fun action. No prior reading is really required, but your kids may enjoy the books more with some character familiarity. It might be hard to care about Aquaman’s pet, for example, when you don’t know who Aquaman is. There are a lot of statements like “Same powers as Supergirl” – this might be confusing. But I think the books are fun enough to get past those minor hurdles – each parent’s answer to the inevitable questions about DC’s rich cast of characters will have to be customized to the child asking. If your young reader just can’t get enough (and the next set of books in the series isn’t released yet) you’ve got several options. I’d be wary of many of the modern ongoings, often aimed at more mature readers, and instead check out any of the tiles on the All Ages DC list. I try to add books that are very accessible to early readers to that tagged listing. In addition, most of the older DC Superhero books are very family friendly. Much of these have been released in a large black and white volume format series called Showcase Presents. Some of the books with content from the 70s are a little more challenging, but generally they’re all kid safe. 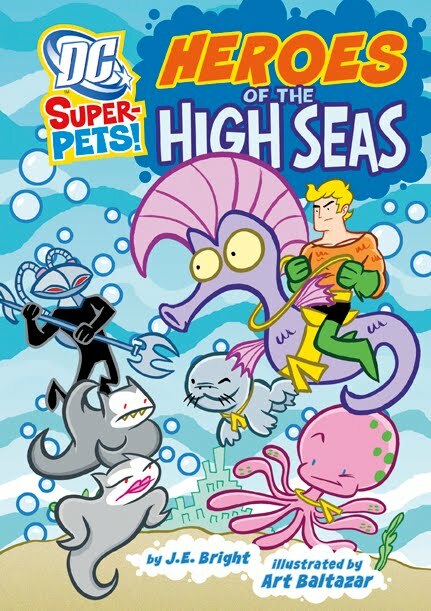 Many of them feature early appearances of characters in the Super-Pets series, like Topo the Octopus in Showcase Presents: Aquaman Vol. 1. Another bonus about Showcase Presents? Those black and white linework pages make excellent coloring books, if you can give up that collector’s protective instinct! Finally, you really must check out the Art Baltazar illustrated Tiny Titans series! It’s a shame I don’t have kids yet. Doing all the voices for my cats just wasn’t as rewarding, though I think they appreciated the Streaky book. This is FANTASTIC to see! Thank you so much for doing this review. My wife and I often wonder what types of comics are out there for the little one. He’s still a few years off from likely enjoying this since his attention span is limited to about 8-10 pages in his current books. I really look forward to picking these up in the future to read with him. I actually like where it says “Same powers as Supergirl” because that allows more discussion between parent and child. 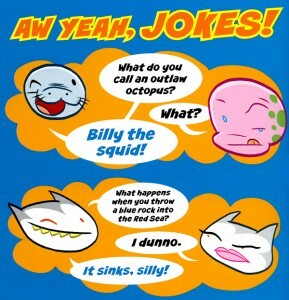 I must say however, after reading the “Ah Yeah, Jokes!” I was disappointed that I didn’t have a laughy taffy in my mouth. Review of this Review: 5/5! They aren’t actually comics and might be worth giving one a shot for him (how old is he anyway? ), but If you like the art here you’ll probably like Tiny Titans as well. Excellent review, it is alwaya nice to read about something a little different; although if I ever do purchase these I will be forced to attempt to place them in continuity somehow. haha you fool, you know not what you do! He just turned one on 1/1/11 (cool birthday huh?). Now that you pointed out that it’s not in panel comic format it will likely be even easier to read to him. My other major concern is one that you addressed in the review, the durability of the book. He doesn’t necessarily need the thick cardboard pages, but he’s no stranger to accidentally tearing a thin page from his books either. I will likely buy one soon to give it a try. Heck if he’s not interested all it means that I’ll hold on to it and try again a little later. Even reading the ingredient list from a cereal box is supposed to help develop language comprehension so anything that I can read to him is a plus. One may be a little young to appreciate it, but I’m absolutely sure he’ll enjoy the sound of your voice. I think you’re right, studies have been done proving that it’s good to read to children even if they are not following the story. If you’re looking for one that you yourself will probably enjoy, I recommend the Green Lantern based one. 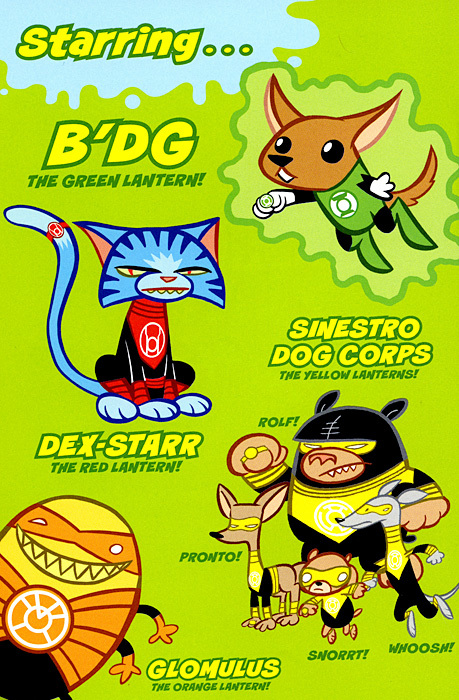 It’s worth having just for the Sinestro Dog Corps. I love the idea of the Sinestro Dog Corps; I’m pretty sure that there is a couple of corps members who look a bit like dogs, wouldn’t they be better suited in the Dog Corps? aw, that’s a nice idea. Sometimes I still wish I had a pair of super hero footy jammies. OK that outfit is enough reason to buy these books! Someone necessarily lend a hand to make significantly articles I might state. This is the very first time I frequented your web page and up to now? I amazed with the research you made to create this particular publish incredible. Wonderful task! Valuable information. Lucky me I discovered your web site by chance, and I’m shocked why this accident did not came about in advance! I bookmarked it. What’s up, after reading this awesome post i am as well delighted to share my knowledge here with colleagues.